Almost everything tastes good fried. One of the ways I like to kid myself that my fried food is high art rather than junk food is to make tempura. If the Japanese people have been doing it since the mid 16th century and the Portuguese even earlier than that, then it can’t be junk. It has a noble tradition. It is also a very nice way to eat a big bowl of vegetables. Tempura batter is easy to make. It is simply flour and water with some salt. Ignore all the doomsaying that it needs egg. Rubbish. The batter should be thin, not gluggy and it must be cold. I put ice cubes in mine and use cold water from the fridge. It is the cold batter hitting the hot oil that creates the explosive lightness in the batter. I can’t even say what the quantities are. You are looking for a consistency that barely coats the vegetables. 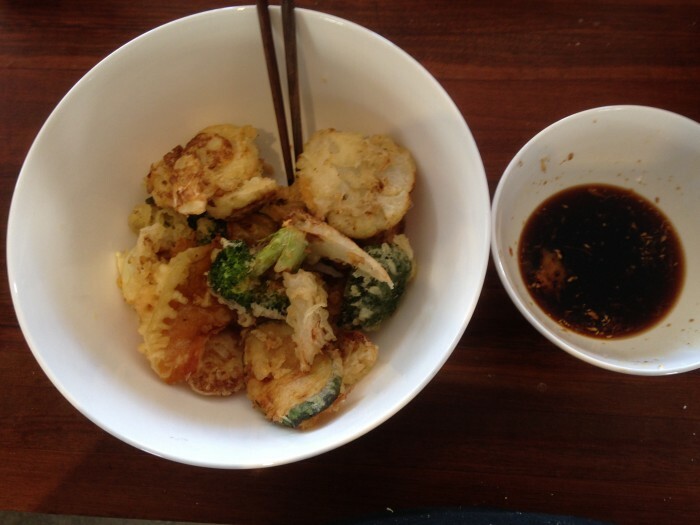 Just about any vegetable is good given the tempura treatment. Today I used pumpkin, zucchini, cauliflower, broccoli and onions. I did the onions last and used up all the batter, pouring the slices and the batter into the oil and ending up with a big fried onion cake. The oil needs to be one that can be heated without smoking, something like rice bran or coconut. I used a combo of the two. I served it all with a dipping sauce made of japanese soy, water and grated ginger.